On Tuesday, October 4, the DC chapter of the Holistic Moms Network is hosting a seminar on hydroponic gardening from 7:00 – 9:00 pm in the community room of the Takoma Park Public Library. The meeting is open to the public for first time members. Agnes Traynor, Master Gardener, will demonstrate different ways of growing your own greens and herbs indoors year-round. She will have a hydroponic garden on display and green, nutritious samples to share. This will be a terrific opportunity to learn how to garden indoors when it is too cold outside! She will also discuss microgreens growing. Microgreens are seedlings that have not yet developed their true leaves. Packed with nutrients, they provide a colorful and unique punch to salads, soups, and sandwiches. Some common varieties of microgreens include broccoli, kale, beet, amaranth, and arugula. You can harvest these homegrown greens within 7-10 days of planting and can enjoy them year-round. Agnes Traynor is a Master Gardener and Wildlife Habitat Steward with the National Wildlife Federation. She owns Home Food Gardens, a local business promoting hydroponic gardening and supporting local kitchen gardens. Agnes demonstrates her commitment to urban agriculture by growing food for her family in their suburban front yard garden while supplementing each season with produce grown hydroponically indoors. The “Hydroponic Gardening and Microgreens Growing” meeting will take place on Tuesday, October 4, from 7:00-9:00 pm in the Community Room downstairs at the Takoma Park DC Public Library. The Takoma Park DC Public Library is located at 416 Cedar Street NW, Washington, DC 20012. There is street parking, and the library is also metro-accessible from the Takoma/Red Line stop. Looks what's in our nest box now! Tom and I were just out taking a walk around the property. I looked up at one of the nest boxes and for a minute, I thought our screech owl was back. But looking closer......it is full of bees! I'm pretty sure they are honey bees. We've had them on the property once before and they hang out for a day or two and then disappear. Pretty cool sight, though. Notice them coming out of the side, too. That is an air hole we made for the owls. The Takoma Horticultural Club (THC) is participating again in the 30th Annual Takoma Park Street Festival by hosting a booth (near Carroll and Tulip) where you can find all your spring bulbs. This is the club's only fundraiser for the year, so please come out, and bring your neighbors and friends! Rain or shine! (We have a tent, and bulbs don't mind getting wet.) Bulbs make great gifts, and extras can be bought for easy indoor forcing to brighten those grey winter days. The festival will have live bands on three stages, over 200 artists and crafters, community groups, food vendors, and much more. Members of the Takoma Horticultural Club get a 10% discount on all bulb purchases. You are welcome to renew or join the club at the Fair. The membership fee is $18 for the rest of this year and through 2012; or you can become a Life Member for $125. See you at the Fair with cash or checks and your reusable tote bags! Directions and details at www.takomafestival.com. What: Landscape for Life Brown Bag Lecture Series: Right Plant, Right Place? Truly successful gardens provide beauty, require little chemical input and give back to nature. By emphasizing Mid-Atlantic native plants and understanding their requirements, the homeowner can have it all! The USBG, in partnership with the Lady Bird Johnson Wildflower Center, has developed Landscape for Life (www.landscapeforlife.org), a program for home owners on sustainable gardening and based on the principles behind the Sustainable Sites Initiative. This Landscape for Life series serves to highlight how home gardeners can incorporate sustainability into their personal landscapes. These brown bag lectures can be done individually or as a series. Here's an article that falls under the "you learn something new every day" category. Apparently, its better for the environment to have your car washed at a professional car wash than to wash it at home. Here are some highlights from a news release put out by the International Carwash Association®. Washing your car at home in the driveway with a garden hose uses about 7 gallons of fresh water every minute. In as little as 15 minutes, washing with a hose can use nearly 100 gallons of water. Carwashes enrolled in the WaterSavers program ( more than 800 car washes across the United States and Canada) meet stringent environmental standards for water use and treatment. WaterSavers car washes use a maximum of 40 gallons of water per car in conveyor and in-bay/rollover systems. Self-service washes in the program maintain high-pressure systems that use 3 gallons of water per minute or less. Research shows that runoff from driveway or pavement washing can harm wildlife. A Washington state environmental firm collected actual runoff from a car wash fundraiser held in a parking lot. Rainbow trout were exposed to the runoff, and all the fish died within 24 hours. A second test, of water that contained the same concentration of detergent a car owner might use to wash a vehicle at home, produced similar results. There is a really great, promotional video about the program on their website washwithwatersavers.com. You can also locate the Watersaver carwash that is closest and most convenient to you. I was visiting a garden center one day and I overheard an elderly couple talking about creating a butterfly garden. They were in their 70's or 80's I'd say, and they were very excited about the prospect of being able to attract butterflies to their yard. They had learned all about butterfly gardening, they said, from their granddaughter, who had learned it in school. I love passing along that story, because I think it is such a great example of why environmental literacy is so important. I don't remember learning much about the environment when I was in school. I do remember refusing to participate when we were asked to dissect frogs. And I remember a horrid "lesson" that required us to follow the progress of eggs in an incubator, taking one out each day and breaking it open to see the various stages of the developing baby chick. That experience made me almost nauseous at the thought of eating eggs for many years. I honestly can't remember one thing I learned in school that helped to foster my present day love for the environment. But much of that is changing in today's school systems, especially in the state of Maryland. Maryland has become the first state to make “Environmental Literacy” a requirement in the school curriculum for all enrolled students as of 2011. "The standards are very broad," said Bill Reinhard, a spokesman for the Maryland State Department of Education. "Maryland is so connected to its environment through bays, mountains and the ocean. This is just a natural progression of what we are already doing. For kids, it's always a highlight of the school year to be involved in environmental course work." Officials said most schools and districts were already meeting the requirements, and the new standards were to ensure every student was getting the same level of education on the environment. "Each elementary school in Anne Arundel County is building a garden for monarch butterflies, as a hook to understand monarch butterflies and ecology of the bay," said Tom Zolper, a representative of the Chesapeake Bay Foundation, which helped push for the requirements. "Often times kids are helping to build the gardens, then they are recording and making graphs, working it into math, social studies and biology. That's in your schoolyard, but kids are using streams that are a block away and taking nets and seeing what microvertebrate are present. " Imagine getting kids so excited about the environment that they can go home and explain to their parents the dangers of pesticides and wasting water and other things that we didn't learn because we were following the stale old curriculums of 10 or 20 or 30 years ago. Congratulations to the state of Maryland for taking this step. I hope that other states will soon follow their path. WHAT: Seminar to promote the environmental benefits represented by rain gardens. Homeowners will learn how to properly site, design, construct and maintain do-it-yourself rain gardens. WHEN: Saturday, October 1st, 9:30 – 12:30. Check-in begins at 9 a.m.
WHO: Hosted by the Town of Herndon’s Department of Public Works and MarymountUniversity, respectively, in cooperation with the Northern Virginia Regional Commission, the Northern Virginia Soil and Water Conservation District, the Community Appearance Alliance of Northern Virginia, and ArtSpace Herndon. WHY: Stormwater runoff is the number one water quality problem throughout Northern Virginia, carrying pollutants to local streams, larger bodies of water and ultimately theChesapeake Bay. Rain gardens allow stormwater to infiltrate into the ground, slowing its flow and preventing pollutants from reaching local waterways. Due to their ability to retain and filter water, rain gardens also aid homeowners in solving drainage or standing water problems. COST: The seminar is free and open to the public. A study conducted by a natural products company, Life'sDHA, and the National Center for Creative Aging (NCCA) has concluded that Maryland has the most beautiful minds. Washington DC came in second. America's Brain Health Index, a state-by-state measure of the nation's brain health, evaluated the 50 U.S. states and the District of Columbia based on 21 factors including diet, physical health, mental health and social well-being. In addition to providing a ranking for each state, America's Brain Health Index also includes comparative data showing how each state has either progressed, held its own or lost ground in taking measures to improve brain health over the past two years. The 2011 America's Brain Health Index shows that the top two brain-healthy geographies in the United States are Maryland (No.1) and the District of Columbia (No. 2). Index comparative data also shows that Maryland has overtaken Washington for the No. 1 spot since 2009. Both Maryland and Washington D.C. are home to two of the Beautiful Minds who are being recognized for their commitment to brain health. View the complete rankings at www.beautiful-minds.com. I was going to attribute these great rankings to gardening, since we know that gardening is good for your physical health and good for your mental health. But I know that Viriginia has just as many gardeners as DC and Maryland, and Virginia came in at # 22! Mental health — continually challenging the brain through activities such as game playing, creative pursuits like gardening, dancing or painting, or learning a new language or skill. If you want to read more about the study, you can direct your beautiful mind to this article. Good morning honey! Happy first day of Autumn. Why don't you take a few minutes to relax while you revisit my post from last year and think about the beautiful time of year that starts today. Move some trees - Remember those trees that were really scary because they seemed a little too close to the house during all the wind from hurricane Irene? Now is a good time to plant or transplant trees. When you are done with your other chores, you can. Fellow blogger Jan Huston Doble always has such beautiful photos on her blog, Thanks for Today. Check out the gorgeous blues, purples and pink flowers she has that are still blooming in her garden this September. I admire her gardens AND her photography. Thanks for sharing your photos today and always, Jan. The weather is cooling down and it's been comfortable, in the 60's and 70's, lately. A few days we've even woken up to 45 degrees here in northern VA. The plants are much happier than they were this summer, and I haven't added any additional water in weeks. It has rained on and off, which is just what my garden needed to lose that 'crispy' look. As a green gardener, I always try to encourage people to deal with their garden pests in an environmentally friendly way. I list many organic pest control methods in this post, Organic Pest Control Methods Explained. But the first step in controlling insects in the garden is to identify what sort of critter you are dealing with in the first place. Here's a great little video that I found on the University of Maryland Grow It Eat It website. It's very information and I really like the bug guy. I'm pretty big on encouraging everyone to take care of their own share of the planet by maintaining an eco-friendly landscape. But in a broader sense, the public lands in your area are an extension of "your share". September 24, 2011 is National Public Lands Day (NPLD). It is the nation's largest, single-day volunteer event for public lands in the United States. NPLD began in 1994 with three sites and 700 volunteers. It proved to be a huge success and NPLD became a yearly tradition. As the hometown of the headquarters of National Public Lands Day (NPLD) and the National Environmental Education Foundation, Washington, D.C. has a strong connection with public lands. The District has a land area of only 68 square miles, but is home to 22 national parks, such as the National Mall and Anacostia National Park. Public lands are intertwined with the culture and history of Washington, D.C.
Rock Creek Park is the location of a National Public Lands Day signature event. Over 200 volunteers will come together to beautify the park in the morning. Later on, they will celebrate at a recreation and health fair in the afternoon.. If you find yourself on the National Mall, head to President’s Park and the Ellipse for the Nickelodeon World Wide Day of Play. There will activities and games for families to get outside and get moving. The focus will be on Let’s Move Outside and recreation education. The National Environmental Education Foundation will be on the Ellipse to join in on the fun. Here are some excerpts from a neat article that I found this morning in the Georgetown Patch. Use the link at the bottom of this post to read the entire article. Plans for a new wetland and gardens at Hardy Middle School will provide an outdoor classroom for students and could serve to better connect the community with the school. Through the District Department of the Environment, Hardy received a grant to build a new wetlands area, butterfly garden and vegetable garden in a marshy patch of grass next to the tennis courts. According to Trinh Doan, an environmental protection specialist at DDOE, Hardy was one of five schools to receive a grant out of approximately 20 that applied. 3. To create an environmental certificate program earned by Hardy Students from sixth through eighth grade. This project is “different from anything else I’ve seen” said Hill, so the DDOE team is “trying out some new things” to work with the existing natural environment. The wetlands and the future gardens have been a true collaboration of local businesses and organizations. Garcia said the Butterfly Garden will be supported through the Monarch Sister Schools Program. DC Greens has also “given us quite a bit of support” said Garcia. The wetlands will be planted during D.C. School Garden Week Sept. 26 through Oct. 1. The butterfly garden will be planted in the spring and the vegetable garden will be part of next fall’s lessons. What makes this project so different? Read the original article for more info. WHEN: Saturday, September 24, 10 a.m. – noon. Check-in begins at 9:30 a.m.
BIG PLANT SALE, GREEN ROOFS, URBAN MEADOWS AND ANSWERS TO YOUR GARDENING QUESTIONS ALL PART OF THE VIRGINIA GOGREEN GARDEN FESTIVAL. The Virginia Department of Agriculture and Consumer Services (VDACS) announces the sixth annual Virginia GoGreen Garden Festival Saturday, September 24, 2011, at the Science Museum of Virginia, 2500 West Broad Street in Richmond, VA. Activities take place in the Gardener Pavilion rain or shine. The multi-faceted event, sponsored by the Virginia Green Industry Council, runs from 9 a.m. to 4 p.m. Admission is $3 for adults, free for children 12 and under. Parking is free on the museum lot. This year’s Festival features plants for display and sale by Virginia growers, plant raffles every half hour, gardening products that can help make your yard the envy of the neighborhood, landscaping services that give your yard that wow factor, information on creating rain gardens using native plants, presentations by Sandy of Sandy’s Plants about fall gardening and perennials that thrive in Central Virginia and much more. Other attractions include Richard Nunnally of WCVE-TV’s Virginia Home Grown answering your plant and gardening questions and Catherine Zimmerman of The Meadow Project with a presentation on urban and suburban meadows. She will sign her book Urban & Suburban Meadows, Bringing Meadowscaping to Big and Small Spaces. Food is available for purchase and Triad from Glen Allen will perform blue grass and popular music. The Silly Bus with entertain children with interactive music, and the sales area includes crafts, garden products, the Countryside Bakery, fall decorations and more. Exhibits will focus on garden and landscape design, green roofs and environmental stewardship for the Chesapeake Bay Watershed. This annual family event is produced by the Virginia Green Industry Council to promote the Virginia horticulture industry, encourage interest in gardening and promote environmental stewardship. Make plans now to attend the Garden Festival Saturday, September 24. Enjoy a few hours of fun and information for the entire family and go home with plants, decorations and ideas to make your garden the best it can be. For more information on the Festival, contact Rick Baker at rick.baker@vdacs.virginia.gov or 301.275.2077. September 19th - 25th, 2011 is National Pollution Prevention Week, a week that highlights the efforts of the EPA, its partners, and the public in making pollution prevention a cornerstone of sustainability. How can I save water in my garden? How can I landscape to reduce polluted run-off? How can I practice green landscaping and gardening? How do I reduce waste in my yard? Eco-Friendly Resources for the Metro DC Area. 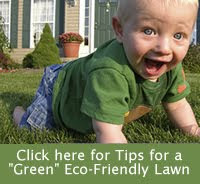 Here, you will find lots of great resources for ways to be eco-friendly in the DC area. Bookmark the list. Link to it from your blog or website. Share it with your kids. Thumb through it on your lunch hour. Or bring it up instead of that game of solitaire that you usually jump too when you need a break from your regular routine. You Can Change the World — Get Started Now! Recently, the Nature Conservancy conducted a survey of 602 young people to get their attitudes about the environment. The good news from the survey is that spending time in nature helps encourage kids to want to protect it. The bad news is, they don’t seem to realize that “nature” and the environment start right in their own backyards. The poll was conducted from July 28 through August 4, and asked kids between the ages of 13 and 18 about their attitudes toward nature, outdoor activity and environmental issues. Topics included: why kids don’t spend more time in nature, how spending time in nature makes them feel and their attitudes toward preserving nature and the environment. The data suggests that if American youth are given more opportunities to have a meaningful experience outdoors, they will be more likely to value nature, engage with it, and feel empowered to do something about it. However, only about 10% of those surveyed say that they spend time outdoors every day. There was a wide range of reasons kids gave for not spending time outside. Discomfort from heat and bugs were at the top of the list. But many of the other reasons given seem to indicate that kids don’t seem to connect time in their OWN yards and gardens as time spent in nature. 62 percent said they did not have transportation to natural areas !!! 61 percent said there were not natural areas near their homes !!! Others cited fear of crime and other safety issues in nature areas. Clearly, either those who conducted the survey or the kids themselves don’t realize the incredible opportunity to connect with nature in a green, eco-friendly landscape. This is especially discouraging because, among the outdoor activities that the kids expressed an interest in, 78% of them said “seeing something beautiful or amazing in nature” which of course, is something that all of them could experience outside in their own eco-friendly yard. 66 percent of those surveyed said that they "have had a personal experience in nature," that made them appreciate it more. Those who DID have such an experience were almost twice as likely to say that they prefer spending time outdoors over being indoors and more than twice as likely to agree that protecting the environment is cool. Clearly, getting kids to see the beautiful and amazing things in nature is key to getting them to care about the environmental issues of our day. • 76% of youth today strongly believe that issues like climate change can be solved if action is taken right now. This means that there is great potential to mobilize members of this generation to get involved and make a difference. • Nearly three-quarters of youth surveyed associate being in nature with being peaceful, free, calm, and happy. Just being outside can help them to cope with stress and anxiety. This makes for happier kids, and happier parents. What does this survey mean to us, as green gardeners? It means that we have the opportunity to not only protect the environment NOW, with our own environmental efforts. But we also have the opportunity to help educate the next generation of environmental stewards by taking the time to share our gardens with our own children, our friend's children or children in our neighborhood. There are many lessons to be learned through green gardening. If kids like to go fishing, you can teach them the importance of preservering and protecting water around the home. If they like birds and hummingbirds, you can teach them why native plants are better at attracting them. If they like butterflies and insects , you can teach them the importance of eliminating chemical pesticides. The findings of the report definitely show that American youth are concerned about the environment and want it to be protected. In fact, 86 percent go so far as to say that it is “cool” to do things to protect the environment. What they lack are opportunities to engage more meaningfully with nature. The more youth are given the chance to get involved with nature, the more their instinctive concern about the environment can be solidified and cemented into long-term commitment to protecting it. There are many articles on this blog that contain lessons that can be learned in an eco-friendly garden. Some of them are listed below. 1) Have a scavenger hunt in your yard (can also be carried out at a local park): Wake up early and take a quiet walk around your yard with a notebook in hand. Look for at least ten wonderful, curiosities of nature that aren’t easily noticed and make a list of them. Perhaps you will see some caterpillars dining on a host plant or a beautiful spider web stretched across two tree limbs or a tiny little tree frog hidden in the leaves of a flower. Make a list of your finds (but not their locations). Give a copy of the list to each of your children or other participants and have a scavenger hunt in your yard. Whoever finds all the items first wins! 2) Play Got W.O.N.! : Similar to the scavenger hunt above, in this activity, each participant is sent out into the yard to see how many Wonders of Nature (W.O.N) that they can find in an allotted time. At the signal of the timekeeper, each participant heads out looking for wonders. When they find something of interest, they yell “Got W.O.N.”, and the name of the Wonder of Nature that they have discovered. An example would be “Got W.O.N. – Hawk feather!” or “Got W.O.N. – monarch chrysalis.” At the end of the allotted time, the person with the most Wonders is the Winner! 4) Be a Detective: Take your digital cameras out into the yard and take photos of as many different plants and critters as you can find. Challenge your kids to use the computer to help ID them. Whatever you do, however you do it, take the time to notice some of the wonders of your garden each time that you spend time there. Sharing them with others is a great way to help ensure that those wonders will still be there, for generations to come. For several years, I have been on the look-out for celebrity nature nerds. Nature Nerds, by my definition, are people that don't just give money to environmental causes. They are the ones that actually get out there and play with bugs and get eye-to-eye with the critters in their yards. The actress — who is a mother of six — says she is such a fan of veteran anthropologist and ape expert Jane Goodall that she and partner Brad Pitt make a point of encouraging their children to be hands-on with nature. “I remember the stories about how Jane used to keep worms in jars when she was little and bring them into the house and I look for that in my children,” says Jolie who appears on a TV biography of the 77-year-old animal lover. Way to go Angelina! We need more celebrities like you who encourage their kids to go outside and get eye-to-eye with nature so that they can learn, firsthand, about the wonders that we are all trying to protect! If you want to know more about my great search for nature nerds, here is a blog post that I originally wrote back in 2007! When I was growing up, there were two distinct types of people: the cool people and the nerds. The cool people were the football players, the cheerleaders, and anyone in a rock band. The nerds were the ones who got good grades, wore black rimmed glasses and were much more likely to have a microscope or a telescope at home than they were to have a date on Friday night. Generally speaking, the birdwatchers and the backyard botanists fell into the nerd category. Cool kids didn’t even know what a chrysalis was much less have one in a jar in their bedroom. But times have changed. Protecting the planet and all of its creepy crawly inhabitants is not only sociably responsible AND socially acceptable but it is also suddenly cool. Sure, there are many different shades of ‘green’, and environmental responsibility takes many forms. Every day citizens and celebrities alike are proud to proclaim their passion for solar energy and hybrid automobiles. But how many of them are ready to come out of the closet when it comes to the more nerdish pastimes such as bird watching and butterfly gardening? How many of them are ready to admit that they not only hug trees, but they also fondle flowers and even caress critters from time to time? Certainly we can imagine animal activist celebs such as Mary Tyler Moore and Ellen DeGeneres getting eye-to-eye with the bunnies and squirrels in their yard. And Martha Stewart must surely appreciate the serenade of songbirds in her flower filled gardens. But what about other well-known environmental celebrities? Do nature lover Darryl Hannah and inner-city gardener Bette Midler welcome the wonders of wildlife to their backyard landscapes? Has Leonardo DiCaprio, Kevin Bacon or Ed Begley Jr. ever marveled at the metamorphous of a butterfly? Do Arnold Schwarzenegger and Pierce Brosnan hang nectar feeders to attract hovering hummingbirds? Has Ted Danson, Willie Nelson or Robert Kennedy, Jr. ever pulled out a magnifying glass to help identify an unknown insect? If they haven’t, then perhaps they should. It’s a wonderful cause to want to save the planet but it isn’t a planet of asphalt and steel and carbon spewing monolithic factories that we are trying to save. It’s the miniscule miracles. The sights that, in the past, only the nerds have taken the time to notice. And it is there, perhaps, when one gets eye-to-eye with the birds and the butterflies and the creatures that visit our gardens and wander through our yards, that we realize what it is we are working so hard to protect. So whether you are a star studded celebrity, a prima ballerina or a single parent , it’s time to admit your nerdiness to the world. Go ahead and get excited about the tadpoles in your garden pond and the butterflies eating your herb garden! Grab the magnifying glass and a good nature guide and share the great outdoors with the ones you love. * You monthly bill for birdseed is greater than your TV cable bill. * You feel bad for the bugs that splatter on your windshield. * You have ever stopped traffic and played crossing guard for turtles, squirrels, ducks or other critters who are trying to cross the road. * You have a birding Life List. * You don’t mind when caterpillars eat all of your plants and are even happy to buy them more. * You have funerals for the critters that die in your yard. * Your neighbors have ever reported you for having an overgrown yard because you have let your landscape “go native”. * You have ever reported your neighbors for cutting down trees that are protected. * You have visited at least one of the stops on the Great American Birding trail. * You know the difference between a lepidopterist and an ornithologist AND you know how to spell them both. * You have suddenly become the “eccentric” neighbor who wants everyone to keep their cat out of your yard. * The binoculars you keep by your back window are for bird watching, not people watching. * You have given first names to all of the various critters that come to your property and you recognize them by name. * You are one of the 70,000+ people who has had your yard certified as a National Wildlife Federation Backyard Wildlife Habitat. * You’d rather capture a bug or spider and take it outside than squish it. And the number one way to tell whether you may be a Nature Nerd…..
* You not only know what a chrysalis is but you have one in a jar in your bedroom. According to the 2006 National Survey of Fishing, Hunting and Wildlife-Associate Recreation, there are over 71 million bird and wildlife watchers in the United States. Rumors among various birding groups on the internet hint that Mick Jagger, Eric Clapton, Carrie Fisher and Paul McCartney may be among the many celebrities that dabble in this nerdish pastime. National Audubon Society - http://www.audubon.org/ - - For over 100 years, Audubon has been working to protect birds, other wildlife, and their habitats. National Wildlife Federation - http://www.nwf.org/ - Founded in 1936, It’s purpose has always been to bring together individuals, organizations and agencies interested in the restoration and conservation of wildlife resources. Cornell Lab of Ornithology - http://www.birds.cornell.edu/LabPrograms/citSci/index.html - The Lab is a nonprofit membership institution whose mission is to interpret and conserve the earth's biological diversity through research, education, and citizen science focused on birds. They believe that bird enthusiasts of all ages and skill levels can and do make a difference. And if you are already a proud nature nerd, please leave a comment below to proclaim your nerdiness to the world!! Ahhhh. It’s that time of year again. Big, brawny men in form fitting clothes, flexing and straining their muscles as they take to the turf with only one thing in mind. Scoring!!! That’s right. I’m talking about FOOTBALL!! Unless you’ve been living under a rock, you probably know that the 2011 NFL Season officially began on Thursday, September 8th, and for the next few months, football will be the only thing on the minds and out of the mouths of many men, women AND children. FedEX Field is the site for a game on Sunday, September 18th at 1pm(ET) between the Washington Redskins (go Redskins!) and the Arizona Cardinals, so you can share this fact over your chicken wings and pitchers of beers. See official NFL Schedule for more dates. The SportsBusiness Journal called the Philadelphia Eagles Go Green initiative "the most comprehensive greening effort of any major sports team." Since launching Go Green in 2003, the Eagles have recycled thousands of tons of waste; greened their entire supply chain; and created Eagles Forest, a 6.5 acre area in Neshaminy State Park, PA where the Eagles have funded the purchase of more than 4,000 trees and shrubs. The CenturyLink Event Center solar array takes advantage of the facility’s new white “cool roof” which conserves energy by reducing the amount of heat absorbed by the roof surface and lowering the need for building cooling. The system covers over 2.5 acres, or approximately 80% of the Event Center roof. CenturyLink Event Center's solar panels are projected to generate over 830,000 kWh of electricity annually, the equivalent of powering 95 Seattle area homes for a year. On Monday, September 26th at 8:30pm(ET), you can check out the buns (on the hotdogs, of course) as the Dallas Cowboy players and cheerleaders battle the Washington Redskins at the stadium that has been called one of the most beautiful eco-friendly stadiums in the world. You’ll have to wait until October 2 at 4:05pm(ET) to see how the University of Phoenix tries to offset 100% of their energy during game days. In 2010, the Arizona Cardinals’s University of Phoenix Stadium used EarthWise Energy program to provide more than 1 million kilowatt-hours of renewable energy during eight regular season home games and two pre-season ones.The renewable energy will offset electricity used in University of Phoenix Stadium -- from the concession stands to the parking lot lighting to the scoreboards. This amount of electricity, 1,135,000 kilowatt-hours over the course of 10 games, is comparable to what 60 average homes in the Valley will use annually. The team has been recycling for eighteen years and regularly donates its sod to local YMCAs and Boys and Girls Clubs of America. Tailgating? No problem. There are 350 ninety-four gallon recycling bins in the tailgating area so there’s no excuse to not use them! NEW ENGLAND PATRIOTS: The Patriots installed 2,800 solar panels at Gillette Stadium in December to help power the stadium, and they put in solar-powered compactors to collect and recycle cans and bottles around the stadium. DENVER BRONCOS: The Broncos have purchased renewable energy to offset 100 percent of the electricity used at Sports Authority Field for the 2011 season. And after implementing an energy management program, the team cut energy use at the stadium by 11 percent. HOUSTON TEXANS: The Texans introduced the NFL’s first interactive media guide in 2009, putting the guide on USB sticks instead of printing books. The change saved an estimated 2.6 million printed pages that year, and the team has continued this practice. Every day, Americans use 79.6 billion gallons of fresh groundwater for public and private use, including for drinking water, irrigation, livestock, manufacturing, mining, and more. On September 13th, “Protect Your Groundwater Day,” the Maryland Department of Environment (MDE) reminds all Marylanders about the value of clean groundwater and what citizens can do to protect this essential and valuable resource. Groundwater is created from rain that falls on the land, running into waterways or soaking into the ground. Water that soaks into the ground is filtered as it passes through various layers of sand, clay, or rock. However, man-made chemicals such as gasoline, fertilizers, and pesticides may not get filtered and can contaminate groundwater. Support Maryland’s Chesapeake Bay watershed restoration effort and all of Maryland’s critical clean water initiatives to reduce pollution from wastewater treatment plants, septic systems, urban/suburban runoff, agricultural runoff and even air pollution controls, which reduce the nitrogen falling on our land and water from power plants, cars, and trucks. Seventeen million gallons of gas are spilled each year in America during the re-fueling of lawn mowers — fuel your lawn mower over impervious surfaces and be careful to not to overfill your tank. Ensure your septic system was installed per current code standards and consider installing nitrogen reducing technology, which protects your drinking water and is good for the Bay. Apply fertilizers and pesticides sparingly to reduce polluted runoff that can contaminate groundwater and water wells. Use water wisely: Don’t pour water down the drain when there may be another use for it, such as watering your indoor plants or a garden, and don’t run a faucet when you’re not using water while brushing your teeth.Learn more about groundwater and Protect Your Groundwater Day here. I know it is human nature to complain about the rain/wind/snow/cold/heat and yet to ignore the days when we don't have any of those things bearing down on us. And when I read the paper in the morning, it seems like it is also human nature to want to dwell on the negative aspects of life and people. No matter what is happening with the weather or the world, my morning walks in the garden generally help me forget all the negative aspects of life and dwell on only the beautiful. It is just gorgeous out there this morning! A light dew sparkling on all the leaves. Tiny little mushrooms popping up in the yard, looking like miniature umbrellas for the critters that crawl through the grass. Butterflies! Birds! It's going to be a beautiful day! I encourage you to take the time to notice it! This post was written by Jeff Smith, the gentleman that I introduced a few days ago in my article entitled Planting Peace – Finding Wonder in a Warzone, about people in military conditions who go to extra efforts to create gardens. In last night's post, From Ground Zero to A Garden, I spoke of Jeff's role on September 11, 2001, as he helped to search for survivors. I asked Jeff if he would like to provide one more guest post, and this is what he sent. As you read it, I hope you will take the time to remember all of the heroes that this country has, both civilian and military, and to give your thanks to them either silently or in person. Please keep in mind that this blog and these posts are not meant to take sides on any political issues. They are just meant to encourage you to think a little more deeply about the heroes of our country. I'm so busy trying to get everything done that needs doing on a short 20 day break. I have several fronts that need attention, so it's easy for the days to slip between my fingers. Hope it's not too late … had a few thoughts for you. In the light of how little time I have home from Afghanistan this year, it's difficult to explain to some people why I'm spending so much time on yard work. After living like a prisoner in Afghanistan for months, shouldn't you be out kicking up your heels, whooping it up? Why in the world do you spend all your time doing YARD work? If I have to explain, they're not going to understand. Maybe I can share with some like-minded individuals who can help me come up with a sound bite that satisfies the vast unwashed, the non-gardening masses. What's so difficult to explain is that, every night as I fell asleep to the sounds of war, I was building this garden in my mind for months. I remember a couple of years ago at a FOB near the Tangi valley, as four and six inch guns fired overhead into the night, sucking the air from the tent with the round's sonic boom, I was thinking about my next group of nectar and host plants for certain species of butterfly. A worried new arrival asked me if that was OK. Is it incoming or outgoing? We had nearly 100 RPGs and mortars come over the Hesco at us that month, in the less favored direction. "That's the sound of freedom, buddy. Go back to sleep." I planted a few more vines in my head, arranging them around a horse fencing trellis supported by agricultural timbers. Beautiful. Rocked to sleep by the comforting lullaby of the Howitzer. We have long days there. Rise at 0230, shower, stuff something in the flight suit pocket for breakfast, check the flight plan, weather, preflight, airborne at sunrise. Will today be The Day? No. Stow that. It's a helicopter pilot's question. One can not stifle it. If you think of every possible thing that can go wrong in a helicopter, amplify that flying low over a fluid, motivated and capable threat, you can be paralyzed. One is empowered and fueled by a wave of positivity in the rotary wing world. It's not bravery or courage – just positive energy supported by confidence, competence and planning. After several hours of flying missions, plan for tomorrow, try to get the one hot meal for the day, wind down, prepare equipment for tomorrow. So now I'm home again, cutting weeds, trimming shrubs and trees, re-arranging irrigation, spreading mulch for winter. I'm setting aside the areas for spring plantings of nectar plants. A gopher tortoise has moved in and established a few giant burrows, so I'm working around those. I'll have to build some natural barriers to keep him from munching my tender new butterfly plantings and maybe plant a little tortoise food plot with prickly pear cactus and some other favorites. Any endangered species is welcome in this little backyard habitat. I go back over next week. I think I'll plan a pond.